Gov. 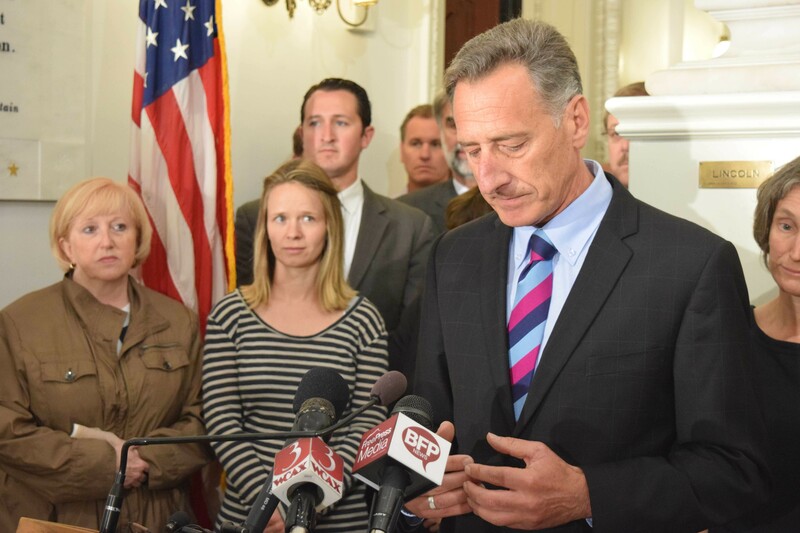 Peter Shumlin announces he won't seek reelection in 2016. Gov. 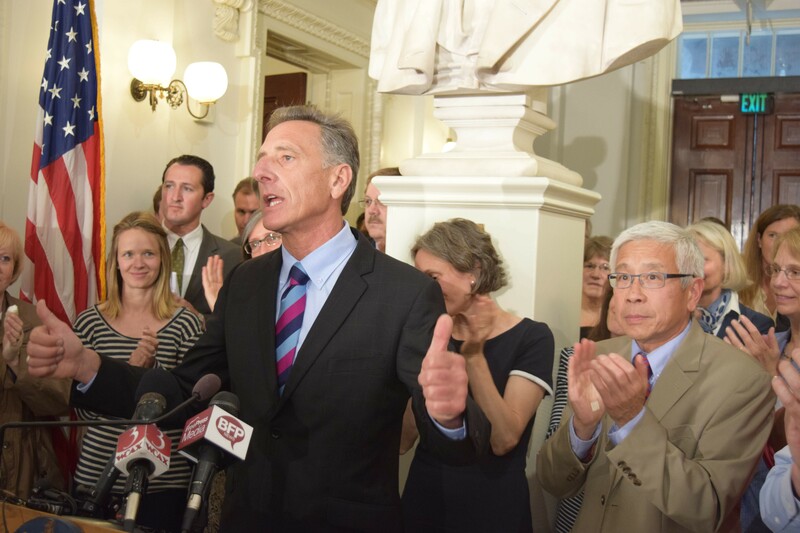 Peter Shumlin stunned the political world Monday with the unexpected announcement that he won’t seek reelection in 2016. The three-term Democrat emerged from a closed-door Statehouse meeting with cabinet members and close advisors just after 1 p.m. to address reporters in front of a bust of Abraham Lincoln. Speaking at times in the past tense, the governor reflected on his four years and five months in office and said he hoped to spend the next year and a half finishing the job he started. The news took by surprise even the governor’s top staffers, many of whom stood by his side for the announcement. Secretary of Administration Justin Johnson said he had found out just an hour earlier. Vermont Democratic Party chair Dottie Deans said she had been summoned to the Statehouse for a meeting about 2016 messaging, only to learn that the field had changed dramatically. As recently as last Monday, the 59-year-old East Montpelier resident had insisted he wasn’t giving any thought to his political future. "I'm five months into a two-year term, and what I'm focused on is doing the job I was hired to do," he told Seven Days last week. But by Monday afternoon Shumlin said he had made up his mind. Shumlin narrowly survived a challenge last November from Republican Scott Milne, a little-known travel company executive with practically no political experience. But the incumbent insisted Monday that his decision was not driven by a fear of losing. “You know me: I love tough races,” he said. Instead, Shumlin advanced a different rationale for stepping down. “I have always thought that the right time for a governor to serve was six years,” he said. Shumlin’s announcement radically recasts the race for governor next fall. Even before last week, several candidates appeared to be openly mulling a challenge, including Republican Lt. Gov. Phil Scott and former Democratic senator Matt Dunne. With the incumbent out of consideration, surely many more will express interest. Vermont’s last open gubernatorial race, when Republican governor Jim Douglas stepped down in 2010, drew five strong Democratic candidates. Shumlin, who narrowly beat then-senator Doug Racine in that year's Democratic primary, went on to face then-lieutenant governor Brian Dubie, a Republican, in the general election. Shumlin declined to speculate Monday on who would or should replace him, though he said he hoped it would be a Democrat. The governor prefaced his announcement by recounting his achievements during his four and a half years in office, noting one major shortcoming: his failure to enact a single-payer health care system — one of his chief campaign pledges. “I had ambitious goals and on the critical issues facing Vermont, with the exception of publicly financed health care, we have put our state on the path to success,” he said. Shumlin highlighted his efforts to bolster early childhood education, encourage renewable energy development, expand broadband coverage and fight opiate addiction. During his remaining 19 months in office, Shumlin said, he will continue to pursue various policy goals, including overcoming technical challenges that have plagued Vermont Health Connect. Lawrence Miller, Shumlin’s director of health care reform, said the administration will continue to seek an all-payer waiver from the federal government to provide flexibility in setting reimbursement rates for Medicare. Miller said he plans to stay on the job until those goals are met. Miller, who learned of Shumlin’s decision Monday morning, said he wasn’t entirely surprised Shumlin chose not to seek another term. “This was in the time range he was talking about,” he said. Other staff members said they took their jobs knowing that job security is subject to the whims of politics. “I don’t think anyone whose No. 1 view of life is security in their job does this sort of work,” said Johnson, a holdover from the Douglas administration who became administration secretary in January. Condos said he hadn’t expected what came. “I was surprised. I would have thought he would’ve waited, but that’s his decision to make and maybe he feels like this frees him up to do his job,” Condos said. Shumlin’s move won’t change Condos’ plans to run for reelection to his own job, but he’s expecting a flurry of interest from others for the governor’s.